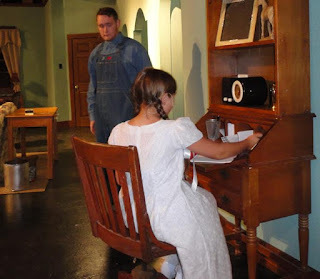 Putnam County Playhouse: "BAD SEED"
The 54th season of Putnam County Playhouse continues with a production of the thriller The Bad Seed. It will be presented July 9-11 and July 15-18. All performances begin at 8 p.m. The Tony-Award-winning play by Maxwell Anderson was first presented on Broadway in 1954 and was filmed in 1956. 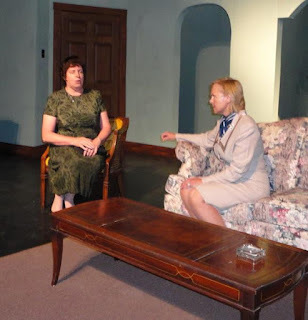 It is a Putnam County Playhouse premiere. The film version received Academy Award nominations for Best Actress, Nancy Kelly (Christine Penmark) and Best Supporting Actress nominations for both Eileen Heckart (Mrs. Daigle) and Patty McCormack (Rhoda). The Bad Seed is directed by Jack Randall Earles. Assistant director is Sandi Rossok. 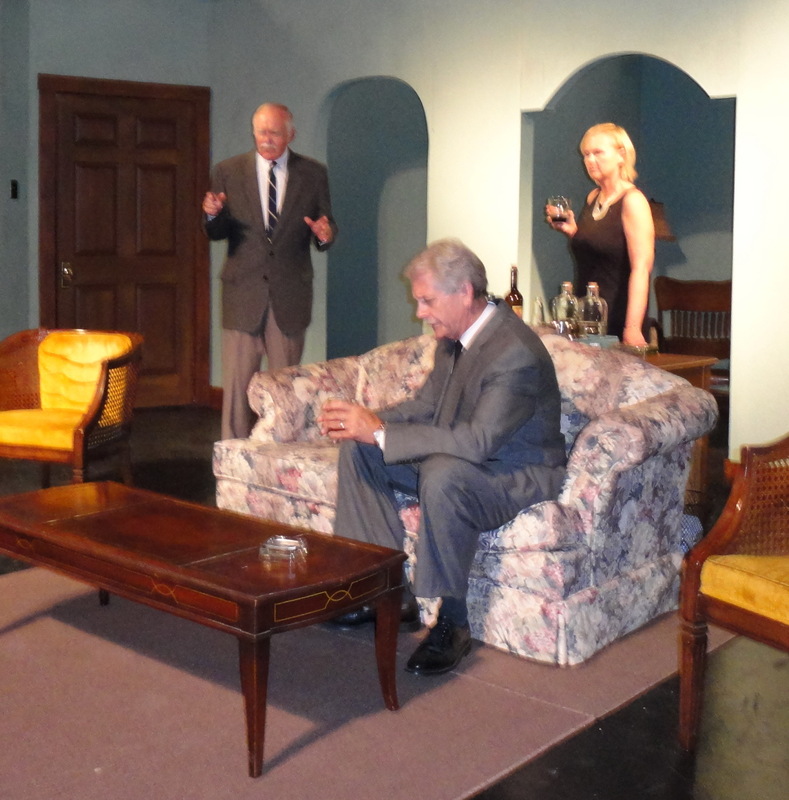 Lighting is by Dustin Bond and set design is by Linda Gjesvold. The technical crew includes Cecily Girton running the sound board and Cameron Wunderlich operating the light board. Jack Randall directed and choreographed Guys & Dolls last season, with Sandi as his assistant. He also appeared in The Man Who Came to Dinner as Banjo, which won him his fourth Upstage Award. Jack Randall is a vice-president of the PCPH board and has appeared in such shows as The Drowsy Chaperone and Never Too Late. Sandi is also a board member and has appeared in many shows including Man of La Mancha and The Curious Savage. Linda designs many of the sets at PCPH. She most recently worked on Seven Brides for Seven Brothers. Linda is also designing the set for the August production of Into the Woods. Dustin played Adam in last month's Seven Brides for Seven Brothers and will direct our final play this season, the mystery-comedy The Game's Afoot. Both are members of the PCPH board of directors. The play was based on a best-selling novel by William March. The mother of a nine-year-old girl is disturbed by her daughter's actions. When one of the daughter's classmates is drowned, the mother begins to wonder if things are as perfect as they seem. What influences a child's behavior most - environment or heredity? The answer as presented in The Bad Seed may not be current science, but it is still thought provoking. Bethany Bax stars as Christine Penmark, a mother who makes a shocking discovery about her own life and how it affects her daughter Rhoda, played by Sonora Erwin. Christine begins to realize just who is responsible for a child’s death as secrets about her own past are revealed to her. Bethany is a member of the PCPH board of directors. She has been in several plays here including You Can't Take It With You, The Glass Menagerie and I Remember Mama. Bethany also directed Barefoot in the Park and The Nerd for PCPH. Sonora appeared earlier this season in the ensemble of Seven Brides for Seven Brothers. The helpful – at times – neighbors Monica and her brother Emory are played by Ashley Anne Vitz and Clarence Long. Mr. and Mrs. Daigle, a pair of grieving parents are Allison Creekmore and Bob Jefferson. Ashley most recently appeared at PCPH as one of the trio of singers in Little Shop of Horrors. She has also appeared in Camelot and Guys & Dolls. Clarence most recently appeared as Big Julie in Guys & Dolls. He won an Upstage Award for his work in Arsenic and Old Lace. Bob Jefferson appeared last season in The Man Who Came to Dinner. Allison Creekmore is making her PCPH debut in The Bad Seed. The cast also includes Larry Sutton as writer Reggie Tasker and Alan Zerkel as Richard Bravo, Christine’s father. Kathryn Dory plays the owner of the local private school, and Dustin Boothby is Leroy the handyman. TJ Tincher is Kenneth Penmark, Christine’s husband and is also production stage manager. Brandon Wunderlich is the messenger and assistant stage manager. Larry is a long time PCPH board member and has acted in and directed many shows. He played leading roles in The Fantasticks and All My Sons. Kathryn is the secretary of the PCPH board. She is returning to the stage after her role as Lily Belle in The Curious Savage. Alan was seen at PCPH in Harvey. Dustin is making his PCPH debut in The Bad Seed. TJ most recently appeared as one of the Pontipee brothers in Seven Brides for Seven Brothers. Brandon and Cameron worked on the same show as part of the crew. Cecily ran the sound board last season for Steel Magnolias. The season continues in August with a production of Stephen Sondheim’s musical Into the Woods.